Denne bog er specielt henvendt til elektronik-begyndere og lærer dig om elektronik helt fra grunden startende med helt basal analog og digital elektronik og frem til microcontrollere. Du vil lære om værktøjer, prototyping loddeteknik, transistorer, 555'ere, etc. alt mens du fuldfører interesante og anvendelige projekter. A nice and tidy intro! Og især en god grundbog FØR du kaster dig over at lege med Arduino. Bogen sørger for at du har den fornødne electronikteoretiske viden og baggrund til at få fuldt udbytte af dit Arduino board. Want to learn the fundamentals of electronics in a fun and experiential way? Start working on some excellent projects as soon as you crack open this unique, hands-on book. Build the circuits first, then learn the theory behind them! With Make: Electronics, you'll learn all of the basic components and important principles through a series of "learn by discovery" experiments. And you don't need to know a thing about electricity to get started. Get step-by-step instructions on building working devices that demonstrate fundamentals such as voltage, amperage, resistance, inductance, and capacitance. Then tackle more complex electronics concepts, including analog/digital conversion, logic gates, and integrated circuits. Along the way, you'll learn valuable tips and techniques, always with clear explanations of what you're doing and why. 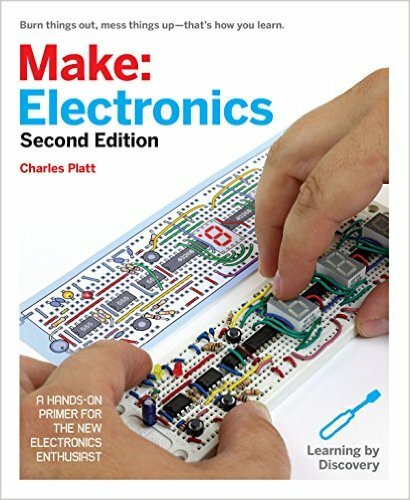 If you've always wanted to learn electronics, but were intimidated by other books and overly-technical websites, this book is for you!